Carreg Lleidr is one of Anglesey’s trickiest to find and difficult to access ancient pagan monuments. However, the curious-looking standing stone certainly rewards the effort required in visiting the small menhir. 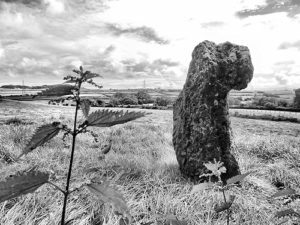 Also known as the Robber’s Stone, Carreg Lleidr is ripe with folklore. The most popular tale attached to the standing stone is that it is a petrified thief who had stolen an expensive bible, whose cover was inlaid with precious gems, amongst other items, from a nearby church and was thus punished by it’s patron, St. Tyrnog. At midnight on Christmas Eve each year, the stone is said to drag itself from the soil to run three times around the field, pursued by demons wielding pitchforks aglow from the fires of hell!